Some traders question whether one can predict direction. I think this is the wrong question. The right question to ask is can one ever know with precision their edge? The answer to that question often determines the actual results that traders experience because most traders end up over leveraging and having poor results. The chart below shows a simple expectancy chart. It shows the given levels of return for an average win and average loss for different winning percentage ratios. It is very basic and purely hypothetical, not based on any actual systems. The risk per trade is determined by the formula 1 / Number of Trades. I think this is a fairly interesting heuristic because to have a 50% drawdown you would need to lose roughly half your trades. Of course, this is a just a heuristic and more advanced methods like monte-carlo could be applied to actual trading results. The table shows that even trading very selectively placing only 36 trades per year that returns from 50% to 80% are possible provided one can achieve a win ratio from 45% to 50% and 2 R or better trades. As more trades are placed, we are able to reduce that needs to be risked per trade. The final row is my attempt to try to fudge the numbers to produce a 100% return. I increased the risk per trade formula slightly to 1.3 / Number of Trades. A question one might wonder is whether a high win ratio or a high R is better. Personally, I would prefer a better then 50% win ratio and better then 2 R. A risk with systems with R’s below 1 is that if the win ratio falls then the system can quickly become unprofitable due to small changes in the win ratio. The advantage is that a high win ratio produces a more stable equity curve which is highly desirable. There are many disadvantages of higher R system if we assume it means we give up a higher win ratio, however. The disadvantages are greater dependence on high volatility, lower equity curve stability, and greater uncertainty in trading. If we manage 2 R or better with a better then 50% win ratio then the system can still be profitable even if the volatility falls and the win ratio drops. Of course, in reality these are often determinants of the market conditions. 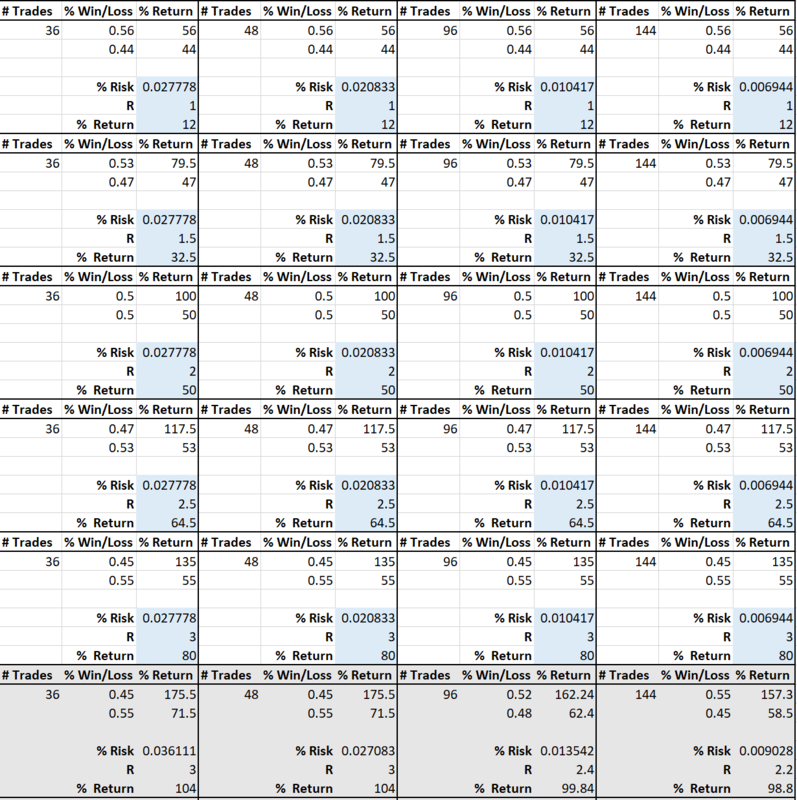 One final aspect this table doesn’t show is the possibility and reality of potential outlier losses. Again, it is a hypothetical but it does give you some insight into what you need to do to achieve a given level of return. In summary regarding the original question, the reality is that one doesn’t have to be able to predict the market direction all that often or all that well to produce worthwhile to significant returns. At the same time, risk must be taken in proper context to the edge.